Since starting on our Junk Free Journey my boys have been the ultimate judges on whether a recipe is good, and whether they like it or not it’s always fun to see their reactions. Recently my 4-year-old brought home a request from his preschool that I send in a powdered drink mix for him to have at school. I spent some time looking at the ingredients of the ones at the store, and just couldn’t find anything that didn’t have a zillion different unpronounceable ingredients, which got me thinking…. Why not create my own drink powder by pounding freeze-dried fruit and pouring it into water? , which I like because they have a really great color and texture (all natural of course!). If you try it at home, let me know what you think! With Easter right around the corner, I’ve been spending a lot of time thinking of how I’m going to turn this usually extra sugary holiday into a real (fun) food occasion. I can tell my kids are getting anxious about how our “Junk Free Journey” is going to be impacting their day of hopping down the trail of jellybean joy. Every time we enter the supermarket we walk smack dab into Easter candy land and as I push the cart past as fast as I can the kids start calling out to the invisible Easter Bunny, “please bring me those chocolates! Easter Bunny please bring me those yellow things!” and whatever else they can catch a glimpse of as we go speeding past. It recently occurred to me that “those yellow things” ( the Peeps) are really just marshmallows, so I started my own Easter hunt to track down a recipe to make these with real food. I am so happy I did because I found the most delicious, easy, recipe on anorganicwife.com that is not only junk free, but is also a million times tastier than the packaged version. And speaking of the packaged version, have you ever taken a minute to look at the ingredients label? yuck! They are little squares of sugar, corn syrup (another word for sugar), dextrose (more sugar), a chemical I can’t pronounce and that I definitely don’t have in my pantry, and food coloring. Since when did we start thinking of these things as special treats for our children?! Why buy this when you can make your own in 15 minutes? And if you have a stand mixer, they basically make themselves! You do need to let them set for 8 hours, which is a major challenge in my house. At the end of 8 hours our pan of marshmallows had several tunnels in it made by impatient little fingers, but they were still delicious and got a thumbs up from everyone in the house (which never happens). 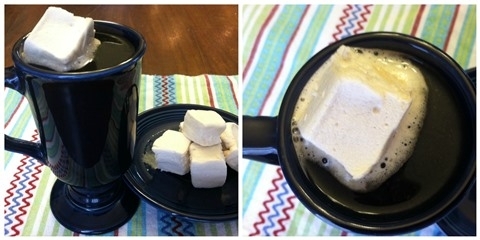 I also discovered they’re delicious on top of my coffee instead of the usual honey and milk I usually put in. Who says you can’t have a “treat” in the morning if it’s made with real food? Boil 1 cup of water and pour 1/2 of it into the bowl of a stand mixture. Add the gelatin and whisk to combine then set aside. To the remaining hot water add 1 cup of honey and heat over medium heat to 230 degrees F. Use a candy thermometer for this and don’t stir it, just let it slowly come to the right temperature. When the honey mixture is ready, turn your stand mixture on medium speed and pour the honey into the mixing bowl to combine with the gelatin. When the honey is all in, turn the speed up to high and let it mix for 5 – 10 minutes until it turns white with soft peaks. Add the vanilla in for the last minute or two. When the marshmallow fluff is ready spread it out in a 9×13 pan that’s lined with parchment paper. Set the pan aside somewhere dry (and out of the reach of little fingers!) for about 8 hours. Don’t put it in the ‘fridge or it will get sticky. Once fully set, turn the pan out onto a cutting board lightly greased with coconut oil (or butter) and cut into squares with a greased knife or pizza cutter. I smeared coconut oil on little duck and bunny cookie cutters and cut out marsmallow shapes. I made this for dinner last night and it was a hit! It’s not often that all of the kids are happy with the meal, but this was the perfect solution. It’s easy to “customize” and I ended up making one bowl with no tomatoes, one bowl with extra avocado, one with cheese, one with only 5 black beans (seriously? ), and I let the kids pick the cilantro leaves off themselves! Bring the chicken broth to a boil and stir in the 2 cups of rice. Bring back to a boil, reduce heat to low, cover and cook for about 35 minutes or according to package directions. Meanwhile, pound the chicken breasts to about 1/2″ thick and season both sides with salt and pepper. Melt the coconut oil in a frying pan and cook the chicken. Flip the chicken, add the chopped green onions to the pan and stir them around a bit as the chicken is cooking. When chicken is no longer pink, remove to a plate and cut into bite sized pieces. Divide rice between 4 – 6 bowls. Top the rice with a couple of spoonfuls of black beans. Add chopped chicken on top of beans. Toss chopped tomatoes and avocados on top. Squeeze 1/4 of a lime over each bowl. Sprinkle with chopped cilantro leaves. I woke up this morning craving pancakes. I think I’m already missing the lazy mornings of last week’s vacation. Fortunately, these pancakes are so quick and easy to whip up they can be served for breakfast during the school week –and in my house that means super easy because school day mornings are the craziest time of day. Orange you glad you choose organic ? 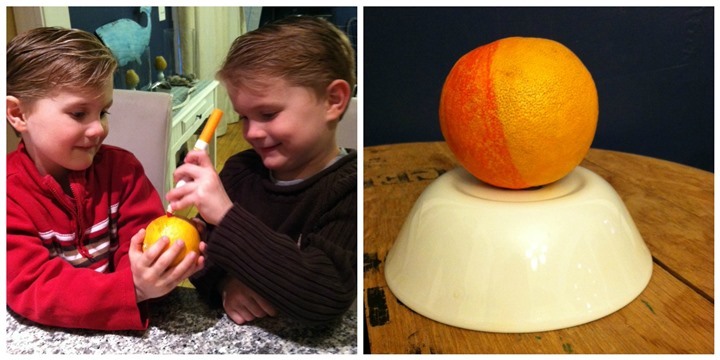 I was floored recently when I learned that some Florida oranges are treated with food coloring to make them orange. Just when I thought I had mastered the challenge of only feeding my family foods without preservatives and artificial colors! This sneaky citrus color is a perfect example of how prevalent artificial ingredients are throughout our food supply and how vigilant we have to be to avoid them. 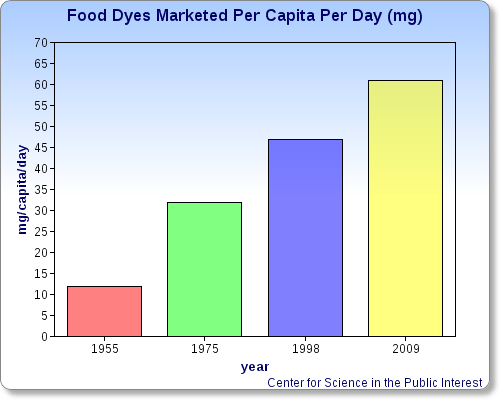 After learning this startling fact I started to do some digging and learned that Americans now consume five times more dye today than in 1955 and there’s been a 50% increase just since 1990. Based on FDA data of certification of straight dyes and lakes (adjusted by the authors for percentage of pure dyes) and current U.S. population.